Figure out the total WEIGHT of the package. Find out HOW MANY SERVINGS are in the package. Divide the WEIGHT by the NUMBER OF SERVINGS and refer to the chart above to make sure you’re serving enough. A package of Eggo Homestyle Waffles is 12.3 oz and has 10 waffles inside. 12.3 oz/10 = 1.23 oz for each waffle. On the chart above, you can see that 1 ounce equivalent of waffles is 1.2 oz. So toddlers and preschoolers need ½ waffle and school agers need 1 waffle. A bag of Pepperidge Farm Whole Grain Mini Bagels is 17 oz and has 12 bagels inside. 17/12 = 1.4 oz for each bagel. On the chart above, you can see that 1 ounce equivalent of bagels is 1 oz. So toddlers and preschoolers need ½ mini bagel and school agers need 1 mini bagel. As part of the transition to ounce equivalents, you need to serve different amounts of a cereal depending on how dense the cereal is. Puffed cereals need the highest volume while granola needs the least. Here’s a chart of all the cereals in each category. Remember: all cold cereals need to meet the sugar limit of 6 grams per dry ounce. If a whole grain is the first ingredient, the cereal counts as a whole grain rich food! 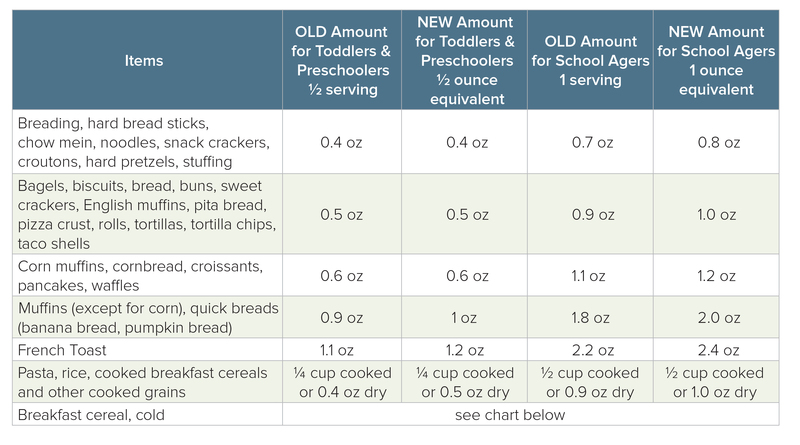 At My Food Program, we’re making the transition to ounce equivalents easy! We’ve already done the math for you! If you have an item that you want added to our food database, simply contact us and we’ll get it added right away in whichever units you prefer.